I have a shapefile in which I need the symbology to be both size graduated and to represent another variable (say for example, "yes" or "no"), and another variable that is a numeric amount (say, from 1 to 10). I'm attaching a diagram to illustrate what I want. I would try using an SQL selection to get features for each text variable and then make an individual layer for each. 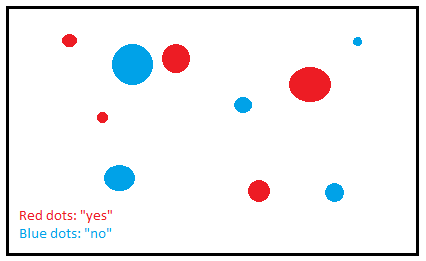 Those can be styled according to the ordinal value, in your example, red for the "no" layer/blue for the "yes" layer etc. For the symbol size, you can use the same variable and scale across all of the layers, but they'll stay different colors. Not the answer you're looking for? Browse other questions tagged arcgis-desktop arcmap symbology or ask your own question. How to write SLD rules with data-defined symbol size and color? Creating symbol with size and color based on two variables in ArcMap? Will symbol size impact buffer size? Representing dataset with long field name using graduated color?